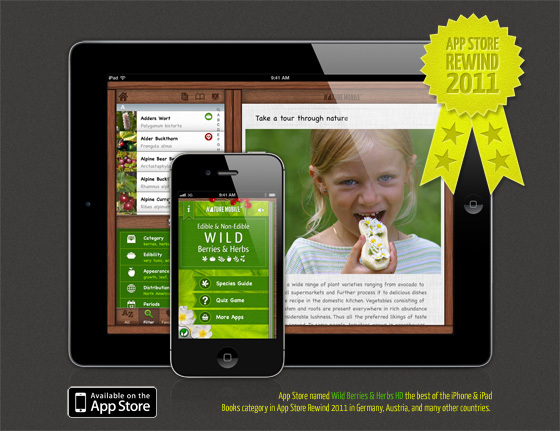 App Store named Wild Berries & Herbs HD the best of the iPhone & iPad Books category in App Store Rewind 2011 in Germany, Austria, and many other countries worldwide. NATURE MOBILE: Wild Berries & Herbs – an ideal guide to the most common species of wild berries, fruits, herbs and selected nuts on your iPhone. With the built-in quiz you also quickly learn to distinguish different species from each other. Finally you have the direct option to identify different species without a book. You get a comprehensive library full of facts, figures and images. Find out where you can find the species, see if you can eat it, or learn how to cook it. Be inspired and experience nature in a whole new way.